We had our first gorgeous spring weekend, and I could not have been more excited to pull out this cute dress I picked up at Loft last fall. I'd only gotten to wear it once before it got too cold, but now it's long sleeves make it just right for transitional spring weather. I've become such a fan of dresses with long sleeves over the years - how often do I struggle to find just the right cardigan or jacket to compliment a sleeveless dress? I wore this dress to a baby shower on Sunday and it was great being able to take off my jacket when I arrived and be perfectly comfortable. Loft actually has a very similar dress available now and it's only $35 - I need to resist! I totally need these shoes in my life! They are so gorgeous! It's super cute! i love the small scale print!!! Maybe I should break out my long sleeve silk-ish dress. Easter perhaps? Haha. What a cute spring dress! I love it paired with the light denim jacket! I've become a big fan of long sleeved dresses recently as well and my collection is steadily growing. I love this one - it seems like a great choice to wear to a baby shower. Loving this dress paired with those adorable white mules! So cute - hope you enjoyed the Spring weather! What a cute look! I love the wash of your demim jacket! Yes I get so cold easily that I feel like it is better to either have my legs or my arms covered. It's nice to find lightweight dresses so I don't always have to wear a cardigan or jacket! That dress is really cute on you! Such a cute dress! I love pieces like this. Perfect for right now before it gets super warm. That is such a cute dress and it looks lovely with the denim jacket! I only have a few long sleeve dresses but they get worn a lot - especially if they are light like this one, I've worn them in the middle of summer for heat protection too! 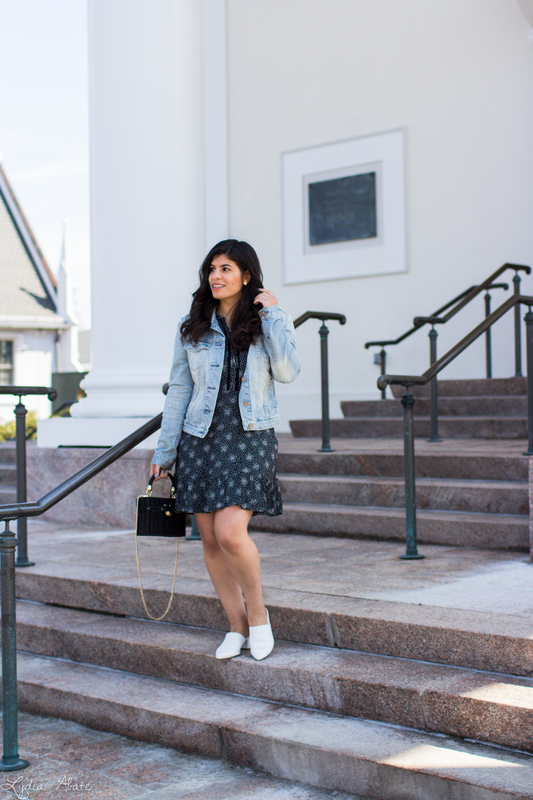 I love a good dress and denim jacket! Such a perfect outfit for those warm spring days! My favorite part about that dress is the neckline. It's so cute! 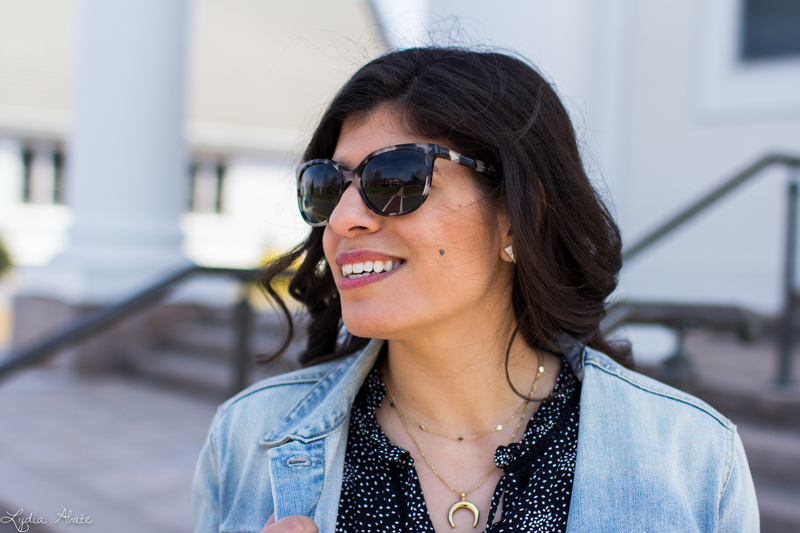 You styled this whole look perfectly for early spring and the cooler temperatures. Girl you look so ready for spring! I live in my denim jacket during this early spring transitional weather. I am so ready for all the spring looks. I adore this dress on you. This is such a cute dress babe! Love how you paired it with white mules and a denim jacket! Loving this entire outfit. It's perfect paired with the denim and mules. 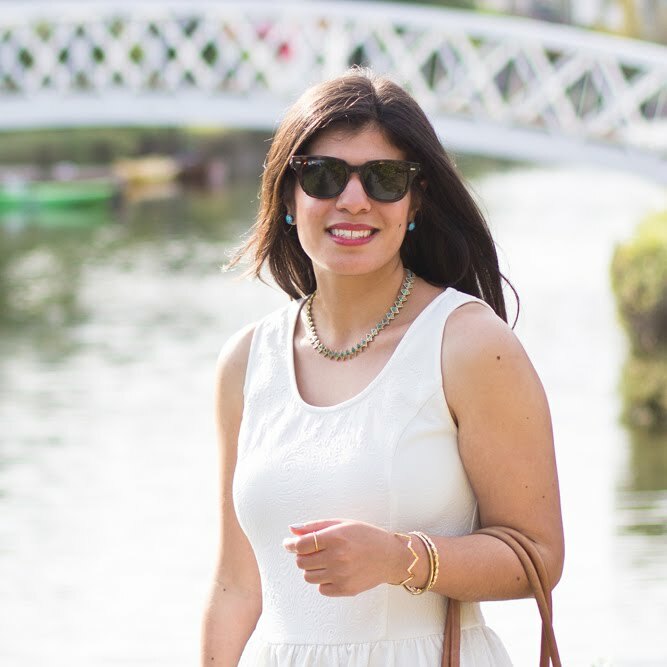 I love the idea of sleeveless dresses, but as someone who cannot go braless, I find that in practise, they are very hard to wear well and feel comfortable in. Which means, especially in recent years, I've been deliberately seeking out dresses with either short sleeves or long sleeves. 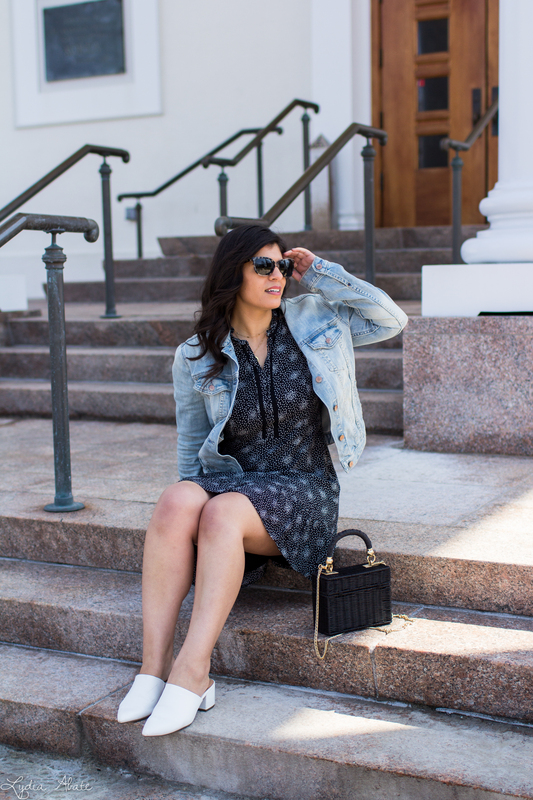 I love both equally, but there is no denying how easy it is to style a long-sleeved dress, especially in the spring, when it's often not truly warm enough to go without something else over top. All that said, I think it's your black straw bag I'm looking at most in these photos - I have the same one but have not used it nearly enough, and I really need to fix that this spring. 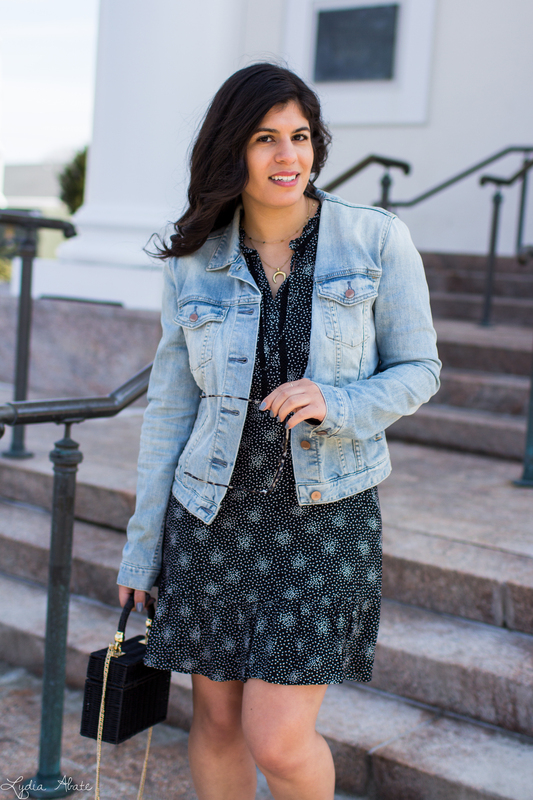 I love adding a denim jacket to my spring dresses! Such a cute combo with your denim jacket and dress dear. You styled it perfectly with those elegant white mules. I wore a similar outfit this weekend and loved it! 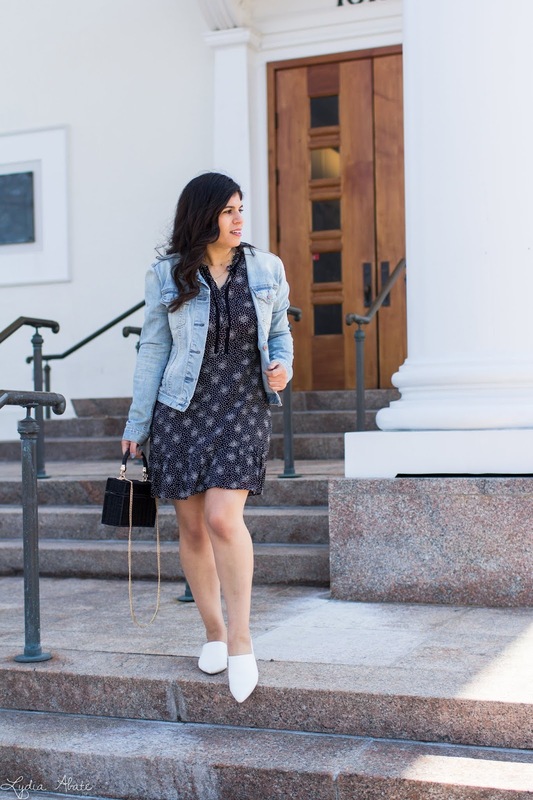 A denim jacket over any little dress is perfect for Spring :) I love your shoes too! Very pretty ! That denim jacket fits so well.